Trade Show Holograms presented one of their large scale holograms as the opener to the 2013 CREW Network convention held at the Omni Hotel in Dallas Texas. The holographic projector opened the conference in grand style with a 3d holographic image 8 ft tall and 15 ft wide. The guest speaker for the conference was Barbara Corcoran ( from tv’s Shark Tank ) who gave the following comments after witnessing the holographic presentation. “I was in the lucky audience that was treated to your amazing opening for the CREW Conference in the Ballroom of the Dallas Omni Hotel. I wanted to tell you It was simply magical, mind-boggling and totally inspirational and I could hear the audience gasp with delight as we rose to our feet to applaud! 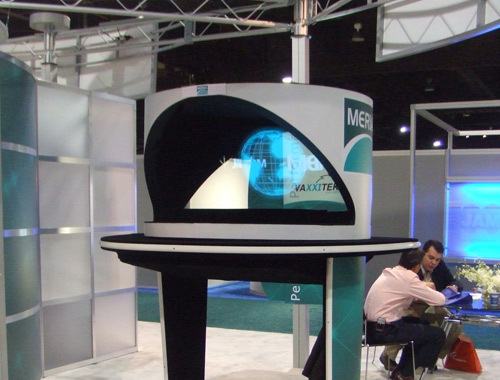 Trade Show Holograms has been offering clients both large and small holograms for trade shows, press conferences and product launches in the USA and Canada since 2006. 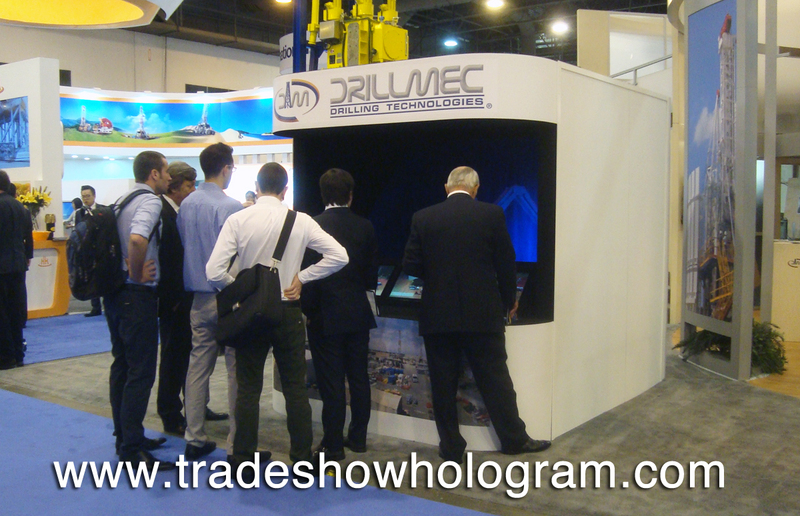 Trade Show Holograms has been providing trade show exhibitors with amazing hologram projectors for over 6 years. The company offers both large scale and standard sized hologram projectors to clients who wish to make an impression and grab attention of trade show visitors. The holographic displays features a full range of animation, color and sound. Moving images appear to float in mid air giving the viewer a 360 degree view of an object as it rotates while floating. The hologram projectors are available for sale and for rental in North America. 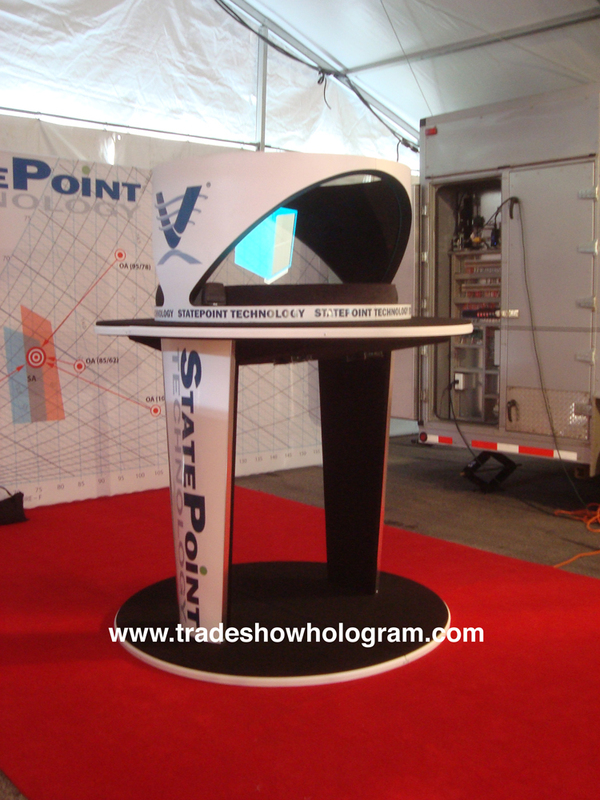 Trade Show Hologram Projector – Holographic Images float in mid air. 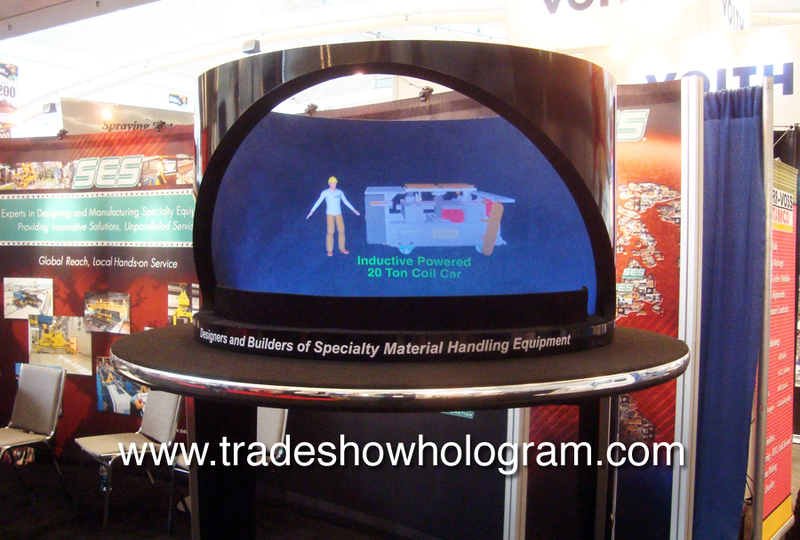 3D Holographic Special Effects for Trade Shows – Attract attention to your booth! Trade Show Holograms is a hologram projector company that creates 3D holographic images that seem to float in mid air. The holographic presentation can range in size from 12 inches to 6 ft tall and up to 20 ft wide. This amazing special effect attracts attention to any trade show booth. Holographic presentations include full animation, colour and audio to help enhance the sensory experience. Hologram projectors offer trade show exhibitors an exciting way to attract attention and visitors to their trade show booth. A 3D hologram projector creates a visual illusion of the clients logo, images, product or video floating in mid air. The holographic presentation can be in full color as well as full motion. Traditional holograms are limited to the greenish distorted static images that move as you pass by them. 3D Hologram projectors offer full animation, color and audio effects. Illusionist Timothy Drake created this version of the Hologram Projector for corporate clients several years ago and later formed Trade Show Holograms, a company that offers hologram rental in the USA and Canada. 3D Hologram Projector on display at a trade show.